Our dear friend and brother in the Lord Evangelist Robert Rivera went home to be with Jesus on 10-01-13. WELCOME & GOD BLESS YOU! 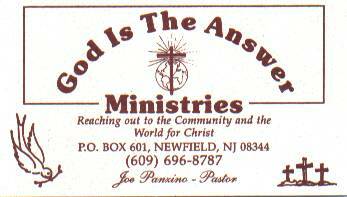 God Is The Answer Ministries was founded in 1976 by Pastors Joseph and Beverley Panzino. The home base is located in Vineland, New Jersey. They have two grown daughters, Lisa Ann and Laura Ann and an granddaughter Christina Rose, all whom work together diligently in this outreach ministry. Pastor Joe and Bev love the Lord with all their hearts, and find extreme joy in living for Him! They are very family oriented, and spend as much time together as possible. Pastor Joe and Bev have been working side by side for over thirty-five years and their hearts are geared towards helping the lost find their way to Christ. Preaching and teaching the Word of God, feeding and clothing the homeless, visiting the elderly and sick, a ministry of health, track/CD/DVD distribution, music ministry and Christian education. They also sponsor a church in India along with several house churches, and helped to build a much needed orphanage in India! Their hearts desire is to reach the world for Christ! Pastors Joe and Bev have a great outreach team who work faithfully with them to reach the lost and hurting! Pastor Joe's parents, Louis and Flora Panzino, both helped with this outreach into their nineties in anyway they could, until the Lord took them home. They were a true blessing! 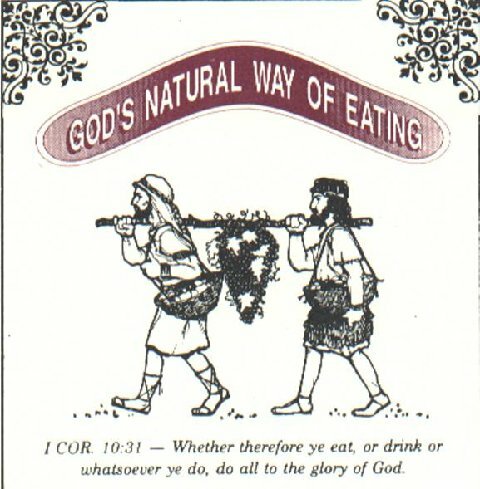 It is the heartfelt prayer of Pastor Joe and Bev Panzino, that all who visit this web site is ministered to by the Lord, and that you can see just what joy and fulfillment living for Him can bring! To find out just how God changed Pastor Joe Panzino's life, please read his powerful testimony and see how he became a real Champion For Jesus! 399 E. Forest Grove Rd. very rare blood disease at a young age. more about this tape set please call the ministry phone line. Your donation to this ministry will help us continue to share the gospel message to the lost and hurting. Your tax deductible gift of any size would be greatly appreciated! Thank You so much!